"O Atlantico está a arrefecer e irá mudar o clima global"
Tópico em 'Meteorologia Geral' iniciado por GabKoost 2 Jun 2015 às 20:57. The good news is our latest research, published in the journal Nature, gives us a much better understanding of these Atlantic oscillations. We now know that accelerations in sea-level rise in cities like New York and Boston on the north-east coast of the US are linked to a cold spell in the Atlantic. The bad news, at least if you’re an African farmer or have a coastal property in New England? We’re about to go into a cold phase. Once we adjust for overall global warming trends, an oscillation in Atlantic sea-surface temperatures emerges. The ocean went through a warm period in the 1930s/1940s and again in the 1990s/2000s. However the 1970s/1980s were much cooler and there are hints of a transition to a relatively cold period at the moment. This is known as the Atlantic Multidecadal Oscillation (AMO), and the transition between its positive and negative phases can be very rapid. For example, Atlantic temperatures declined by 0.1ºC per decade from the 1940s to the 1970s. By comparison, global surface warming is estimated at 0.5ºC per century – a rate twice as slow. In many parts of the world, the AMO has been linked with decade-long temperature and rainfall trends. Certainly – and perhaps obviously – the mean temperature of islands downwind of the Atlantic such as Britain and Ireland show almost exactly the same temperature fluctuations as the AMO. 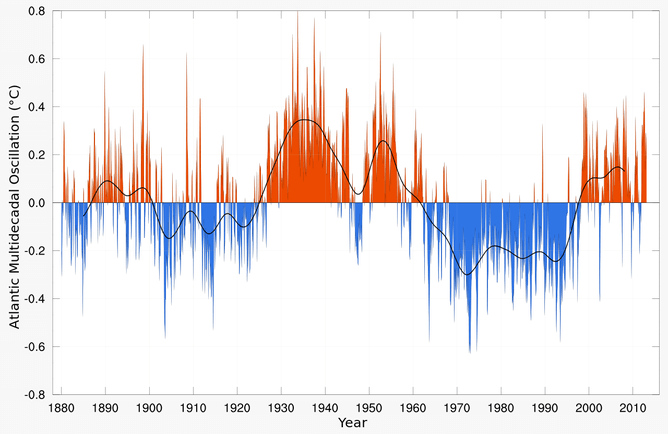 Atlantic oscillations are associated with the frequency of hurricanes and droughts. When the AMO is in the warm phase, there are more hurricanes in the Atlantic and droughts in the US Midwest tend to be more frequent and prolonged. In the Pacific Northwest, a positive AMO leads to more rainfall. A negative AMO (cooler ocean) is associated with reduced rainfall in the vulnerable Sahel region of Africa. The prolonged negative AMO was associated with the infamous Ethiopian famine in the mid-1980s. In the UK it tends to mean reduced summer rainfall – the mythical “barbeque summer”. Because the AMO influences a range of climate conditions in different parts of the world, it is important that the mechanisms driving it are properly understood. What Drives The Phases Of AMO? Scientists have widely hypothesised that ocean circulation, and in particular the Atlantic meridional overturning circulation which sends warm surface water northward (the Gulf Stream) and deeper cold water southward, drives the phases of the AMO by moving heat around. However, we do not have direct observations of ocean circulation of sufficient duration to support this theory, which has lead some to question whether the AMO is actually controlled by the ocean. We have measurements of the strength of the Gulf Stream flow in the Straits of Florida since 1982 and the flow across the Greenland-Scotland ridge since the mid-1990s. Since 2004, we also have continuous, full-depth, basin-wide measurements of the Atlantic overturning circulation with the RAPID monitoring project at 26ºN. However, none of these records are long enough to directly link ocean circulation with the decadal climate variations such as the AMO. Sea-level measurements from tide gauges on the other hand extend back more than 100 years in places. Many studies, dating back to 1938, have used this data to study variations in ocean circulation. In our latest research we were able to show that differences in sea level along the US east coast provide a measure of the strength of ocean circulation. Sea-level fluctuations from Florida to Boston can be divided by Cape Hatteras, where the Gulf Stream leaves the coast to flow eastward. The difference (south minus north) is representative of ocean circulation, and more circulation means more heat is transported. By comparing our sea-level index against the AMO index we were able to provide, for the first time, observational evidence of the widely hypothesised link between ocean circulation and the AMO. O que é que um eventual arrefecimento do oceano Atlântico poderia, teoricamente, influenciar o Sul da Europa e nomeadamente Portugal?! Eu penso , embora não tenha a certeza , que isso tem a ver com a teoria de um cientista que afirma que o degelo do Ártico vai provocar uma subida do nivel do mar mas também do seu arrefecimento , o que paradoxalmente provocara um arrefecimento muito acentuado do hemisfério Norte abaixo do Ártico ( alias penso que o filme o " Dia Depois de Amanha " de baseia um pouco nessa teoria ) . E que a circulação predominante da Europa de tornara essencialmente continental , com mais vagas de frio mas também um clima mais seco com e com menor circulação atlântica . Não creio que seja esse o conteúdo do artigo uma vez que ele fala em padrões repetitivos que ocorrem ao longo das décadas (ver o gráfico). Ou seja, o degelo não está aqui representado como causa da mudança climática. De qualquer forma espero que um eventual arrefecimento não corte muito na precipitação pois eventos de Neve precisam-se!